Posted on December 19, 2017 , in Fitness Equipment. A huge misconception about getting fit is that you need to go to a gym or exercise studio. This misconception can be discouraging for people with not much time or people who can’t afford a gym membership. 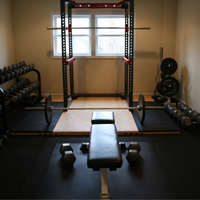 Luckily, you can get a fantastic workout at home. At home, fitness can be intimidating to individuals who don’t have many exercises in their repertoires. In this article, you’ll the key components of an at-home workout and how to build your own workout. When working out at home, you’ll want to split your workout into four parts. As the name indicates, a warmup helps to warm up your muscles to help prevent injury. Muscles can be easily strained if you try to move them too quickly or lift something too heavy if they’re cool. If you have a piece of cardio equipment like a treadmill or elliptical at home, you can set that to a low resistance and warm up for about 10 minutes. Jumping rope and jumping jacks are great warmup alternatives if you don’t have cardio equipment at home. Once you’re warmed up, you can increase the intensity of your cardio exercises. If you’re just starting out with a fitness routine, aim to do 30 minutes of cardio 3 times per week. Cardiovascular exercises help strengthen your heart and burn calories. If you have cardio equipment at home, increase the speed or resistance of the machine to get your 30 minutes in. If you don’t have cardio equipment, you can go for a brisk walk or run outside. Indoors, try burpees, high knees, mountain climbers, and jump squats. You don’t need heavy barbells or dumbbells to do strength-building exercises. In fact, many basic exercises like pushups and squats are considered strength-building or resistance exercises. When starting out with a strength-building workout, you want to start with your body weight. Exercises like pushups, squats, planks, and wall sits are all great places to start. Once you build up strength after a few workouts, you can add small amounts of weight by holding a large water bottle. Just as the warmup is important to protect your muscles from injury, so is the cool down. Cooling down is a controlled way to bring your heart rate back down and to let your muscles return to a resting state. To cool down, you can do low to moderate cardio exercises like biking or walking. You can also combine your stretching and cool down by doing a short yoga sequence. Whether you plan on working out at home every day or just a couple of times per week, it can still be hard to find motivation to keep working out. Here are some tips to help you stay motivated. If you ever get stuck in an exercise rut, turn to the internet. There are tons of videos and articles with at-home, no-equipment workouts you can easily adopt into your workout routine. If you’re just starting out with working out, try setting goals like “I want to be able to do 10 full push ups in 30 days.” There are no bad goals, just set ones that make sense for you. When you set your goals, write them down in a journal and track your progress toward them. Tracking your workouts can also help you notice what kinds of workouts really excite you and which are too boring or easy. By now you realize you don’t a gym membership to get a great workout. When you know all the components of a workout – warmup, cardio, strength, and cool down – it’s easy to create a basic yet effective workout. When you need a new challenge, you can look online for new exercises. Once you master working out at home, spread the word and help get your friends into working out at home, too! If you are ready to get the right fitness equipment for your home workout, download our latest promotions to save.